Made of high quality, weather-resistant stainless steel, this ultra-handy accessory with its dual spring gates will hold, secure, and connect everything from house keys and cell phones to technical camping gear. Attach valuables to the center bar for ultimate security, link gate ends to a second set of items and anchor, or connect many items together. Smaller-sized S-Biners<sup></sup> are excellent for connecting two zipper sliders on backpacks, duffels, and suitcases. We know that one size doesn't fit all, so we've designed six different sizes so you can choose the right size for the task at hand. We've found that the smaller sizes work great for hanging smaller items from a purse or backpack strap, attaching to individual keys, or hanging a plant from a ceiling hook. The larger sizes work great for bigger jobs like hanging a paint can from a ladder or a tool to your tool belt. But, the list goes on and on. Limited lifetime warranty. Contact 1-800-678-6483. Heavy Duty T-Hinges are designed for 2 x 4 and 4 x 4 post applications. ideal for projects with wide mounting surfaces such as barn doors, storage bins, tool boxes and gates. Fixed pin is non-removable. Can be used for right or left hand applications. Can be used for full or half surface installations. Throw away the hammer and forget those pesky hardware pieces. The High & Mighty Decorative Hook is a tool free solution to any wall hanging need. Simply Place, Push, and Hang your decor. A revolutionary solution to decorating and organizing, High & Mighty Wall Hanging Hooks are designed to be Stuck Up. This 5-in-1 Multi Tool Money Clip can be a bottle opener, wrench, screwdriver, and ruler while securely holding and separating your cash and cards. Forged from heat-treated stainless steel, this money clip won't bend or break, and is small enough that you'll always have the tools you need whenever you need them. The Key Band-It is a durable, comfortable, stretchy key wristband equipped with a polycarbonate S-Biner MicroLock and a stainless steel split ring to keep keys close at hand and easily accessible. The accordion-style design features latex-free TPR material that slides easily over a hand to be worn around the wrist or arm. The included S-Biner Microlock allows for quick connection to the band or split ring, making it an ideal place to keep keys to which you need frequent access, or for key holding when you need to be hands free. As an added bonus, there is an integrated key slot in the band which allows you to hold a key flush to your arm in a low profile way. 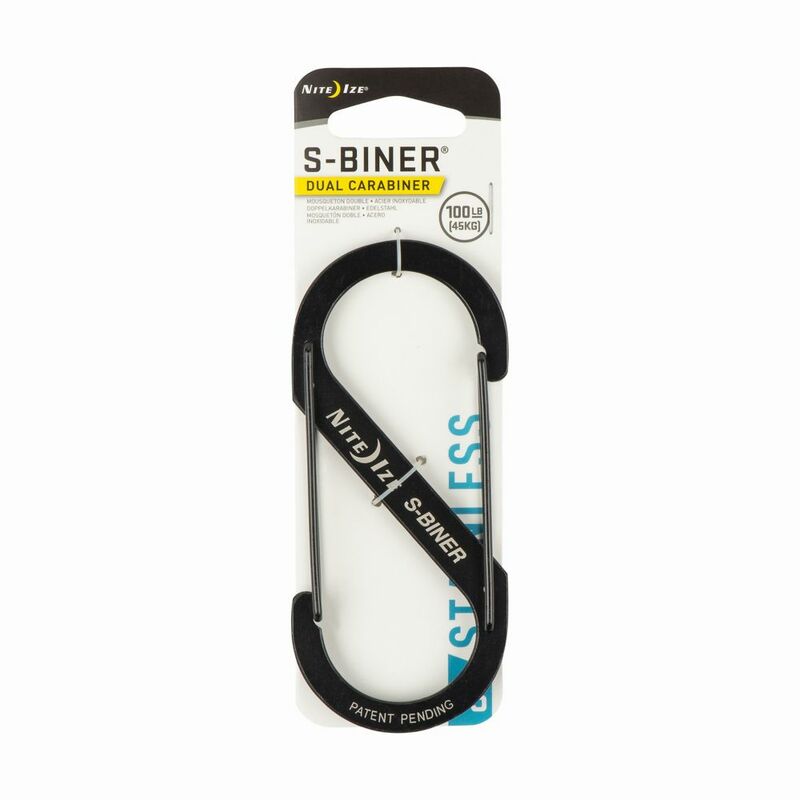 S-Biner Size #5 Black Made of high quality, weather-resistant stainless steel, this ultra-handy accessory with its dual spring gates will hold, secure, and connect everything from house keys and cell phones to technical camping gear. Attach valuables to the center bar for ultimate security, link gate ends to a second set of items and anchor, or connect many items together. Smaller-sized S-Biners<sup></sup> are excellent for connecting two zipper sliders on backpacks, duffels, and suitcases. We know that one size doesn't fit all, so we've designed six different sizes so you can choose the right size for the task at hand. We've found that the smaller sizes work great for hanging smaller items from a purse or backpack strap, attaching to individual keys, or hanging a plant from a ceiling hook. The larger sizes work great for bigger jobs like hanging a paint can from a ladder or a tool to your tool belt. But, the list goes on and on. S-Biner Size #5 Black is rated 4.6 out of 5 by 13. Rated 5 out of 5 by William from Great item The wife uses them to secure the zippers in her collapsible dog crates while at agility dog shows. Rated 4 out of 5 by Bob._J. from Like the Idea; Wonder about Springs Until now, I've used a heavier, standard clip on my belt for a long watch chain style keychain. I bought these for a better looking option. I have examined them and I'm sure they will work fine, but have not actually worn them yet. Concerning the one bad review concerning seizing up with seawater exposure, I wonder if that might not happen with almost all such hooks. I wonder how many designers and manufacturers think about what the internal spring will be made of and whether it will be as resistant to corrosion as the stainless clip itself. Rated 5 out of 5 by Lisa from Perfect for real estate signs and riders These work perfect for my real estate signs and riders. I feel like I have been looking this exact thing for the last 30 years! Rated 1 out of 5 by E.L.S. from Don't use these in seawater! We bought several of these in two sizes. Within a single 15-day trip, every one of them seized up with rust. Rated 5 out of 5 by Linda G. from Just what I needed! I was looking for some mini-caribiners to hook a couple of small tools onto my camera tripod. I bought the #1 S-Biner (2-pack) at a hardware store. They were small enough and so very easy to clip on and off. They work so much better than regular carabiners! So happy I found them! Rated 5 out of 5 by Mike Flannery from I really like S-biners! I hook these to various locations o I really like S-biners! I hook these to various locations on my laptop backpack to hold things like my keys and a small TSA approved Leatherman. I also use various sizes of S-biners when camping to organize camping stuff and to connect ridgelines for lightweight tarps. Rated 5 out of 5 by Jerry Ross from I'm hoping a 5 means the best! It's a wonderful clip. Coul I'm hoping a 5 means the best! It's a wonderful clip. Couldn't find this size around here, but love it. Rated 5 out of 5 by Tom Wedell from My wife is a weaver for each project, she has to change her My wife is a weaver for each project, she has to change her pedaling on the loom. She found your S-Biners at our local hardware store, but they were too large. She asked me to order #1's and they worked perfectly.